Recorded as from Massachusetts. Purchased in 1947 by Edgar William and Bernice Chrysler Garbisch; gift to NGA, 1953. American Primitive Paintings from the Collection of Edgar William and Bernice Chrysler Garbisch, Columbus Museum of Arts and Crafts, Georgia, 1968-1969, no. 19. Extended loan for use by Vice President and Mrs. George H.W. Bush, Vice President's House, Washington, D.C., 1981-1989. Extended loan for use by Vice President and Mrs. Dan Quayle, Vice President's House, Washington, D.C., 1989-1993. Is She or Isn't He? 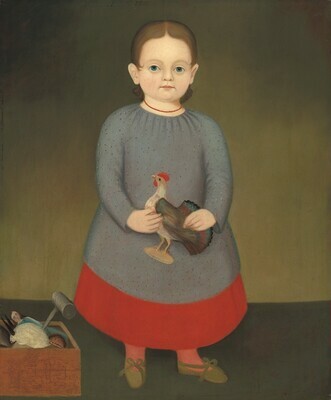 Identifying Gender in Folk Portraits of Children. Heritage Plantation of Sandwich, Massachusetts, 1995, no. 63, repro. American Paintings: An Illustrated Catalogue. National Gallery of Art, Washington, 1980: 276, repro. American Paintings: An Illustrated Catalogue. National Gallery of Art, Washington, 1992: 403, repro. Chotner, Deborah, with contributions by Julie Aronson, Sarah D. Cash, and Laurie Weitzenkorn. American Naive Paintings. The Collections of the National Gallery of Art Systematic Catalogue. Washington, D.C., 1992: 491-493, repro. 492. Schorsch, David A. "The Myth of G. Gustemer and the Recognition of George Gassner." Antiques and Fine Art (1 March 2015): 161 fig. 8, 162-163, as Attributed to George Gassner.